When you hear me speak of influential women in my life, at the top of my list is my Mom followed by my maternal Grandmother - Popo Chock. You rarely hear me speak of my paternal Grandmother - Popo Char. Although she lived with us for a time, we were separated by language, often requiring my father to interpret for us to understand the most basic things. As is true of so many things, some of my happiest memories are connected to food. 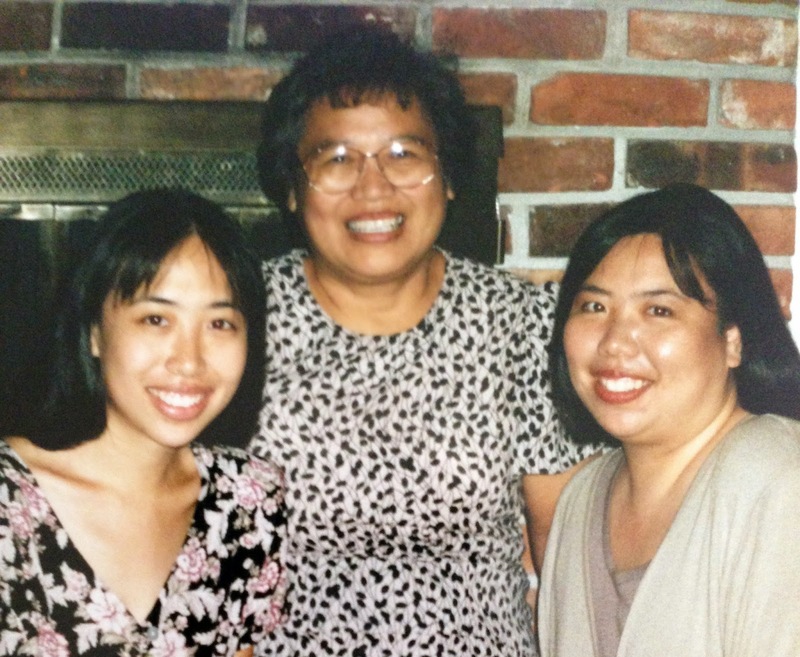 On this Mother's Day I wanted to share a recipe that connects three generations of my family - Popo Char, my Mom, and my sister. Like many of her generation, Popo Char cooked by feel and memory, not from a written recipe. While she lived with us my Mom spent time learning some of her recipes, diligently observing and writing down ingredients, quantities, and methods for different dishes. One thing I liked best, and we only had it once a year, was Popo Char's gao. Also known as nian gao, this is a dessert made at Chinese New Year. Made of glutinous rice, the texture is similar to Japanese mochi although the flavor is quite different. Popo Char baked her gao but it can also be steamed for a firmer texture. When fresh, gao is soft and sticky. My Mom would often use thread to cut the gao instead of using a knife. After several days, we would also fry pieces in butter to give it a nice crunchy outside layer, keeping the inside soft. After Popo Char passed away, my Mom continued to make her gao. And after my Mom passed away, my sister continued the tradition. I'm very grateful for my sister, this is just one of the many traditions she carries on for our family. When I was last home I spent time with my sister learning how to make gao. I'd seen my Mom make it many times and it always seemed a lengthy and time consuming process. My sister showed me that it really wasn't as difficult as I thought. The ingredients, while not things I often use, are readily found at an Asian grocery store. Among them are wong tong (Chinese brown sugar) and Mochiko (glutinous rice flour). The recipe also calls for canned yams. I've always thought this was an odd ingredient and I've never used it for anything else. The pan is also lined with both foil and leaves to protect the gao while it's baking. In Hawaii we use ti leaves (most known for making grass skirts). However, you can also use banana or lotus leaves (usually found in the frozen section of Asian grocery stores). While I don't expect to make this often, it remains a fond memory and strong connection to my family and its traditions. Remove the ribs of leaves for lining the pan (ti, banana, or lotus leaves). Quickly dip in hot water to soften. Prepare a large baking pan by lightly oiling it. Line with foil then a thick layer (6-7 layers) of ti, banana, or lotus leaves. Add one more layer of heavy foiled, oiled. Set pan aside. Boil wong tong and granulated sugar in water to dissolve the sugars. (You can also substitute the sugars with 2 cups of brown sugar.) Cool. Press the yams through a ricer. Measure the Mochiko into a large bowl or pot. Add cooled sugar water and strained yams. Knead by hand until smooth. Batter should be the consistency of a thick pancake batter, more water may be needed to gain the desired consistency. Pour batter into the prepared pan. Completely cover the pan with heavy foil. Bake at 350 degrees for 1½ hours. Turn down over to 300 degrees and bake for another 1½ hours. I wish I had a picture of Popo Char to share. Instead I have this picture of me with my sister and my Mom, taken quite awhile ago. Happy Mother's Day!